Thanks to the amazing work of Martin Fjordvald, the 4th edition of Nginx HTTP Server (which was, at the time of the 1st edition, the first-ever book about Nginx) is as of today available for purchase in libraries and online. Congratulations Martin! This book is a detailed guide to setting up Nginx in ways that correspond to actual production situations: as a standalone server, as a reverse proxy, interacting with applications via FastCGI, and more. In addition, this complete direct reference will be indispensable at all stages of the configuration and maintenance processes. This book mainly targets the most recent version of Nginx (1.13.2) and focuses on all the new additions and improvements, such as support for HTTP/2, improved dynamic modules, security enhancements, and support for multiple SSL certificates. 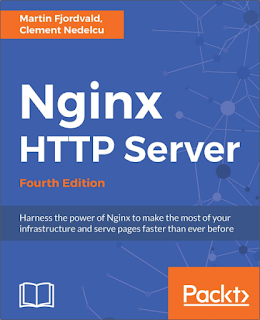 This book is the perfect companion for both Nginx beginners and experienced administrators. For beginners, it will take you through the complete process of setting up this lightweight HTTP server on your system and configuring its various modules so that it does exactly what you need quickly and securely. For more experienced administrators, this book provides different approaches that can help you make the most of your current infrastructure.